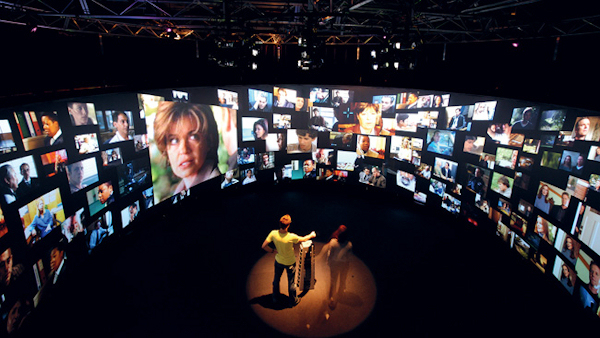 I took my daughter to a special screening of several AVIE-produced projects at the UNSW iCinema and she found the experience compelling. We were instantly down a mine shaft in 3D. After we made a wrong choice there was an explosion, and we felt terrified and claustrophobic as we tried to navigate our way out of the rubble. Then we were in a restaurant, hearing the conversations, watching the faces and body language, and trying to solve a psychological mystery in an interactive film called Eavesdrop. We visited countries in speeding cars; and sat on top of an archaeological site in India. Here is a case of interactive technology filling a real social, educational need – and not just an entertainment distraction. The potential applications are huge. This is the classroom of the not-too-distant future. Our kids will travel the world in 3D – and feel they are really there. They will go to a 3D refugee camp and be exposed to full facial expressions, grief and fear, prompting prefrontal cortex stimulation. They’ll go to the Uffizi Gallery in Florence and walk up to paintings that will unfold before them, the virtual reality or “avatar” artists seeming so real they’ll want to talk to them. They will build virtual buildings with their hands and gaze up at the structures. At this stage, many people share a large space together and they talk and engage with each other, which is all part of the socially enriching experience. But over time, as the technology develops further, it will shrink down so it can become part of a circular home TV/computer system that can fit over a small family, like the cone of silence in Get Smart. This new world of 3D immersive environments will be much better for our children’s developing brains, offering contextual problem-solving and a deeper understanding of human and environmental challenges. Social media and technology are moving in ways that no one can predict. It’s an exhilarating ride and quite the opposite to the messages being offered by a few fearmongers. Or, in Twitter talk: @readers. Great hope. Kids brains to grow. New Technology cool. Plug in now.